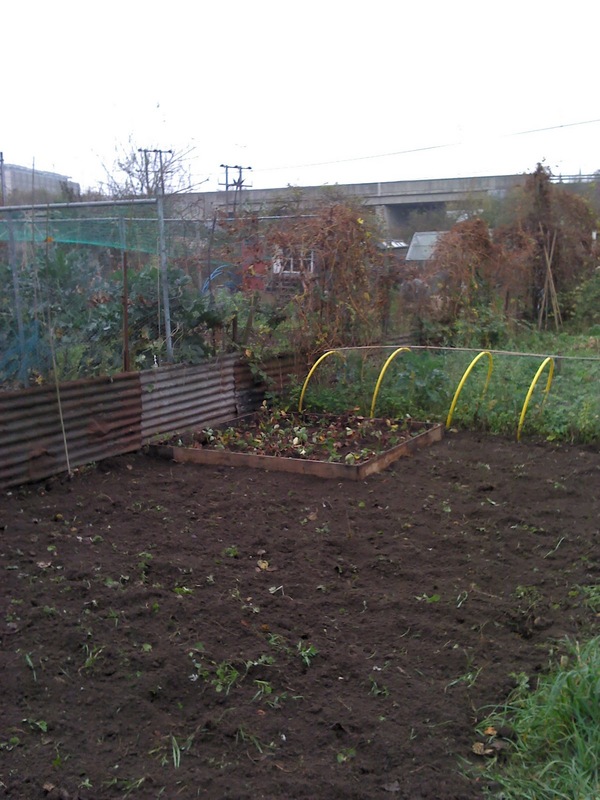 I thought I'd do a quick update on our allotment, to be honest not much has been going on, just keeping it clear and getting it ready for next year. We didn't get as much as we had hoped for, but in all fairness it did take some time to actually get it into a usable state, so fingers crossed for next year. The pumpkins we grew did okay, not massive but usable for both eating and carving. And some lettuce, in October ? My wife part cooked the flesh for use in soups and anything else we can think of cooking with it, by the way roast pumpkin with your Sunday dinner is very good, just cut it up and chuck it in with the roast spuds. I have a variety of projects on the go at the moment, the most important is the dolls house I'm building for my daughter, fingers crossed I'll get it done before Christmas, but I have plans for sorting out the allotment plot and making it look a little tidier, for a start I need to build a proper compost bin system, I have the wood, just need an extra hour in the day. 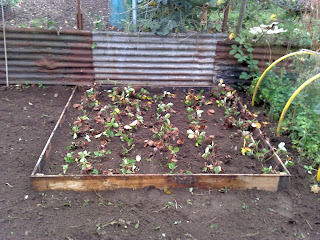 However I did manage to get the strawberry plants we got from freecycle planted in their own raised bed. I had planned to use the runners from the plants we have in the back garden to start a strawberry bed going at the allotment, but our strawberries didn't do so well this year, not sure why, but as luck would have it someone on freecycle offered a load of plants, free to a good home, so I jumped at the chance, and as it turns out I got 80 odd plants for the price of a push bike ride, and a bit of digging, 80 plants is a lot, but it didn't even make a dent in the strawberry bed they came from, and I was 1 of 8 that was lucky enough to get some plants. 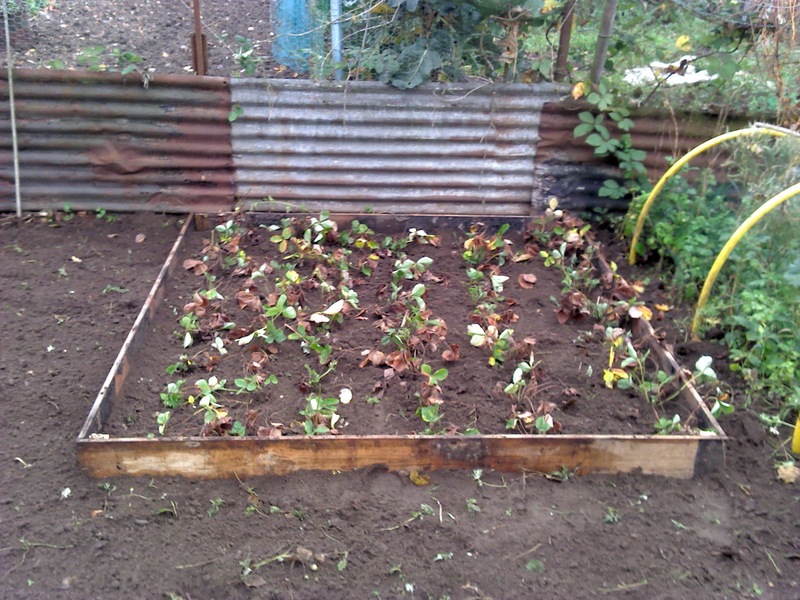 So I trundled down to the plot the next morning and set about clearing a space for them, and building a bed. They look a little sad, but they'll soon perk up. So I have a fair chunk of the plot cleared, just needs some feeding, I have a load of homemade compost to go into the ground, which now feels much better than it did when we took the plot on, although a bit of rain has helped that. And that's about it really, it seems as though the weeks spent weeding are starting to pay off, and with some careful planning next year we will get the most out of the plot, more of everything, least that's the plan.